The AFI (American Film Institute) nominations, courtesy Variety: award ceremony to be televised 1/5/02 on CBS. (Television nominations are also out for the same show; see this page for the full list.) Updated: Winners are added in red. TV winners are listed beneath the film awards in order of presentation. For those of you keeping score...here's who won the TV categories (in order of presentation--we're just typing with the ceremony on TV here, kids). The complete nomination list is at www.afi.com. Best Actress in a TV Miniseries: Judy Davis, Me and My Shadows (accepted by "Judy Garland's daughter," presumably Lorna Luft, as Judy Davis could not attend). Interestingly, the actress who played the young Judy Garland (Davis played the older, if you haven't caught that yet) was nominated against Davis. Disagree with the AFI's picks? Call the critics out on the message board! Sean Astin and Elijah Wood, introducing the LOTR clip above, are forced to per-form inanely scripted banter about their LOTR tattoos. But it all pays off in the end. 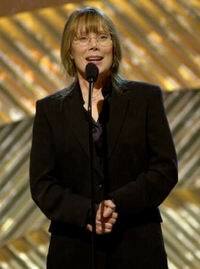 Sissy Spacek accepts the Best Actress award for her performance in In the Bedroom. This--and a spate of other laurels--puts her as, in essence, the (current) front runner for the Oscar. 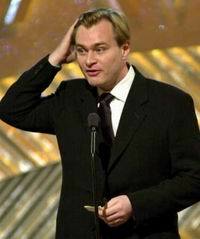 Memento for Screenwriter Best for award the accepts Nolan Christopher director/ writer. We were going to post more winners' pictures, but turns out there aren't many--not many stars showed up, causing the press to dub this the "MIA Awards."